I used the keys on the camshaft sprockets, it's the exact same thing. Use that with 5 links to set your cams together. I guess this is a good place to mention again how to tighten the crank pulley bolt. With nothing holding the crank still, you may find it difficult to tighten the crank pulley to spec. With the timing belt installed, I used a ratchet with a deep-well socket. Insert the handle of the ratchet between the spokes of the upper timing gear, so it rests under the boss for the exhaust cam, off to the side of where the exhaust cam rides in the head. If you start poking your ratchet handle through the gear you'll see where it has a nice fat non-load-bearing aluminum protrusion sticking out. The deep well socket is so you can put a pipe/cheater bar over it. Now you have a ratchet handle going through the timing gear, touching the cylinder head, and a pipe pointing straight up toward the hood. Have your assistant pull back pretty hard on the pipe toward the passenger side of the car. Without the timing belt installed but with the transmission installed, you could try a big flat-head screwdriver in the ring gear, through the starter's mounting hole. Note that this method involves being in a possibly-impossible or uncomfortable position under the car, as well as having to remove the starter (duh). You now have sufficient tension on the crankshaft, via the timing belt, to tighten the crank pulley bolt to 130ft.lbs. It is a little scary, but you can use the starter to loosen the crankshaft bolt. Use a long ratchet or breaker bar, attached to the socket on the crank pulley bolt, with the other end sitting against either the ground or the bottom of the lower control arm. Arrange your breaker bar so that a CLOCKWISE rotation will push it against something solid. Bump the starter (turn the key to "start") VERY BRIEFLY. NOT ENOUGH FOR A FULL TURN OF THE ENGINE! The crank bolt will now be loose enough to remove. An impact wrench is the preferred tool to remove the crank bolt, but sometimes you have use what you have. When you go to remove the crankshaft pulleys, they may slip right off if the car was running recently. If not, apply heat from a hair dryer on low for a few minutes and they will be looser. You are going for "warm or very warm to touch, through a latex glove," not "HOLY SH*T MY HAND!!!" when the pulleys are warmed this way. When reinstalling the crank pulleys, heat them before you try to install the pulleys. This will make them MUCH easier to fit to the crankshaft! Also, be careful not to loose the key stuck in the crankshaft. Without that woodruff key, NOTHING keeps your engine in time. When you are getting ready to tighten the timing belt, be sure that the tension side (the right side, the side that rolls on the idler), is already pretty tight. If it isn't, you will throw the cam timing off, pulling the slack out of the tension side. When you tighten the tensioner, you will need a 5mm allen key. On my car, at least, adding belt tension by rotating the tensioner also, simultaneously, tightens the tensioner mounting bolt. It makes it feel like the belt is tight, but instead the tensioner has got tight, by rotating the mounting bolt. 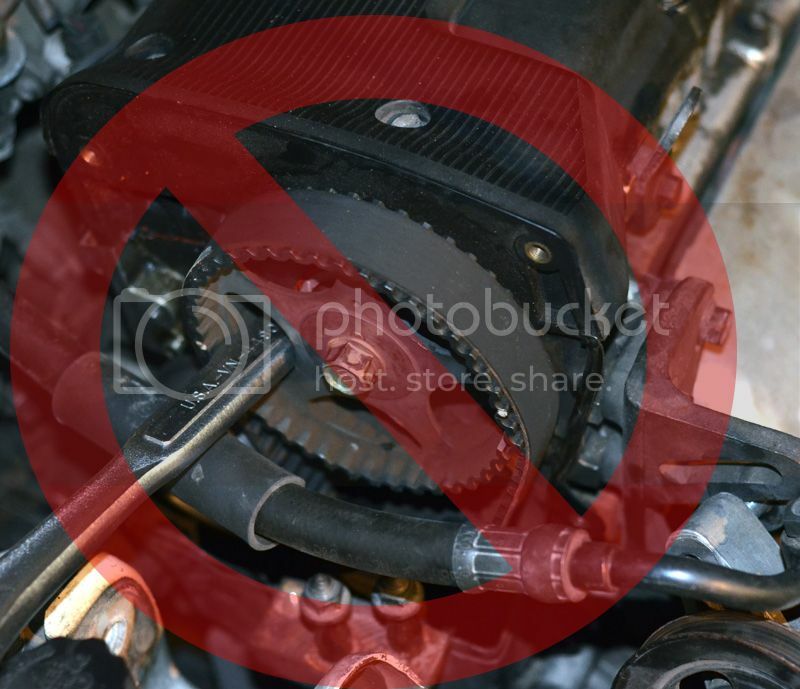 Back off the bolt holding the tensioner to the engine, so that it does not tighten itself. When you get ready to finally tighten the tensioner bolt, BE SURE to hold the allen key firm in the tensioner. When you tighten the bolt, it will try to rotate the tensioner clockwise, tightening the belt also. Hold anti-clockwise pressure on the allen key, to keep the belt tension correct as you tighten the mounting bolt for the tensioner. When you have tightened the tensioner mounting bolt, double-check belt tension. On the tension side, pluck the belt as if it were a guitar string. If it makes a high pitched tone, that is way too tight. You are looking for somewhere between a dull flop and a low note, when the belt is plucked. If the belt is too tight, the engine will sound (whine) as if it has a belt-driven supercharger on it. This leads to accelerated belt wear and premature failure. If it is too loose, it will skip time and ruin the intake valves. If it sounds a high note, back off the mounting bolt while still holding the tensioner. Loosen the tensioner just a couple of degrees, and tighten the mounting bolt again. Check the belt tension again! Rotate the engine one turn by hand, to be double-sure you didn't screw it up and the valves don't hit the pistons. THEN you can finally start the engine. necro-bump updated with a warning about a possibly not-great way to hold the engine still while tightening the crank pulley retaining bolt. I will add that there are two distinctly darker links on the cam timing chain which where the timing marks on the cam sprockets should align, this will give you proper alignment and take the guess work out of installing the cams.